Northern House Clearance > House Clearance News > Hoarded House Clearance Newcastle – The Woman Who Could Not Throw Anything Away! Need a cluttered/hoarded house cleared? At Northern House Clearance, we are experienced at dealing with clearing extremely cluttered properties on behalf of our clients. It can seem like a hopeless task, but don’t worry – it isn’t! The property can be cleared by us without any fuss or bother. Even in situations where it is impossible to get into areas or whole floors of the property. Read more about our cluttered house clearance service. We undertake house clearance in all areas of Newcastle: North Shields Killingworth Ryton Gateshead Hebburn Hetton-le-Hole Houghton-le-Spring North Shields. The Woman Who Could Not Throw Anything Away! 72-year-old Frances Riches has been obsessively building a collection of papers, ornaments, boxes and books in her home for the past 20 years. Her hoarding is a form of Obsessive Compulsive Disorder (OCD), and it has gotten to the point where she cannot use most of the seven rooms in her home, however she has started to make progress sin cleaning the mess. “I am making strides,” Riches told the newspaper of her three-year battle to sort her life out. “You can now see the floor and tables in my living room, which simply wasn’t possible a few years ago. 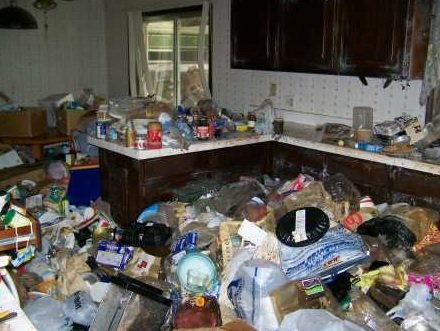 Many obsessive hoarders need a push to help them realise what good quality of life they could have if they only worked to overcome their condition. Once they realise this, they can enlist the help of professionals to undertake a complete house clearance, going some way to supporting them in their goal of becoming clutter free. However this process can take a long time, as Riches has proved, and is a constant battle for the hoarder in question. “Hoarding carriers a huge stigma and most people with it are covered in shame. I can’t tell you why I can’t just throw things away because there are so many reasons,” Riches admitted.